What is it about short football tournaments at the Rizal Memorial Stadium that they seem to attract thunderstorms and torrential rains like sugar does ants? There was almost an air of inevitability when the skies opened up just before second half kick-off in the 2014 Philippine Peace Cup match between the Azkals and Chinese-Taipei; and for both teams to be called in for a lengthy interruption with roughly half an hour remaining in the match. So long, as a matter of fact, that ABS-CBN Sports+Action was able to insert and finish the entire 9 o’clock news before the match was resumed. Not to mention give Azkals fans a chance to sneak a peek at how Gilas was doing against Puerto Rico in the World Cup. A lot of good the interruption did for the Azkals, however, as it allowed the team to regain focus after a less than assured start to the second half. Rob Gier dove to meet Phil Younghusband’s cross in the 21st minute to give the Philippines the deserved lead. James Younghusband, who strode into more central striking positions than he ever did in an Azkals shirt, added the second in the 38th minute by completing Misagh Bahadoran’s solo break down the left flank. Of course, at the back, there seemed to be a competition between Müller – whose distribution was uncharacteristically poor on the night – and the defence as to who would grant Chinese-Taipei the diplomatic goal. In truth, the first half was an evening duck shoot; and Chinese-Taipei were lucky to return to the dressing room just the two goals down. Manny Ott, recalled to the side after two years, was first to James Younghusband’s inviting cross in the 7th minute but almost looked surprised to have been given such an open header and steered the ball wide. A schoolgirl would have scored. Ott finished better with a crisp shot after being set up by Misagh Bahadoran in the 42nd minute; but the Chinese-Taipei goalkeeper managed to get his fingers to the ball and pushed it away for a corner. James Younghusband found younger brother Phil with a measured cross in the 27th minute; but the country’s top marksman did not have his shooting boots on and finished well wide. Phil’s best work, in fact, was being done mostly out in the flanks, where he was attracting defenders out of position perhaps by reputation alone. All credit to Chinese-Taipei, who came out for the second half with better purpose. In fact, just before the referee called the teams in, the Philippines backline had to be alert to keep out a series of chances that the visitors were managing to carve out for themselves. It has to be said, however, that renewed vigour in the Chinese-Taipei attack was as much due to their determination to seize the initiative as it was to the Azkals taking their foot off the pedal. The drop in focus and intensity will be something for Thomas Dooley to ponder. The teams in the AFF Suzuki Cup will have sharper teeth than Chinese-Taipei had last night. But then the rains, just like what the doctor ordered, fell like there was no tomorrow. The Philippines quickly seized the initiative back soon after the resumption; and James Younghusband must have thought he had scored his brace in the 60th minute when he rose above the Chinese-Taipei defence to powerfully head brother Phil’s freekick towards goal. The post was in the way. Five minutes later, Phil had a clear sprint at goal from almost the halfway line and had a fairly decent angle to find the far post with a well-placed shot. Such is his current state of confidence as a striker, however, that he opted to square the ball rather than shoot. A sliding Chinese-Taipei defender duly obliged with what he could not do and turned the ball in for a chastening own goal and the Philippines’ third. Chinese-Taipei responded well and almost got a goal back inside a minute when Gier had to clear almost from off the line with Philippines goalkeeper Roland Müller beaten. This was a case of bad collective defending after the Philippines once again took their foot from off the pedal. Cue the Mark Hartmann show, and one wonders if the player who scores goals for fun in the UFL can replicate his league form for the national team if given a start. In the 74th minute, Patrick Reichelt, who reinvigorated the right flank since he was sent on, laid on a square ball for Hartmann to finish crisply. This was merely the appetizer for the best goal of the night, a flowing move in the 88th minute. Curt Dizon did the dirty work down the left flank before cutting the ball back towards the middle, where Chris Greatwich sold Chinese-Taipei the most delightful of dummies. Hartmann, arriving late, sent the ball crashing into the net. This duly arrived in the 80th minute in between Hartmann’s brace, inevitably served on a silver platter by way of a poor ball out of defence. 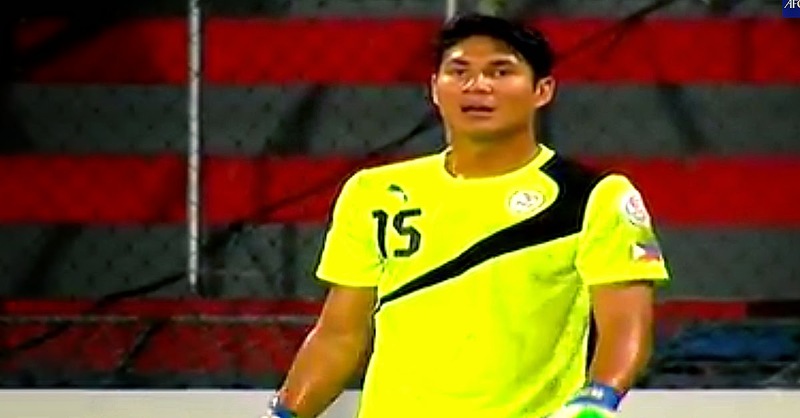 The Philippines will meet Myanmar for the title this Saturday for the 2014 Peace Cup title. Myanmar sprung an early surprise by comfortably defeating the Challenge Cup champions, 4-1, in the tournament’s opening match.